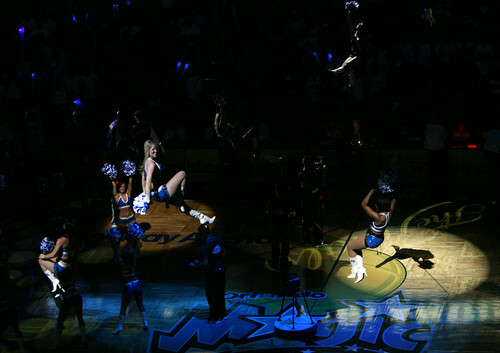 We continue our review of NBA dance teams with the 2016-2017 Orlando Magic Dancers. The Orlando Magic basketball players aren’t the only ones working hard during Finals. The Magic Dancers are also breaking a sweat to keep the crowds entertained. Click here to view photos from last night’s game in Orlando. LEESBURG — Deanna Clover has been a performer for as long as she can remember. She has performed in dinner theaters, danced on cruise ships and as a member of the dance teams for the Orlando Predators of the Arena Football League and the NBA’s Orlando Magic. Clover’s lifetime on stage has allowed her to travel the world as a promotional tool for the NBA and the Magic, and reached a peak this year when she was chosen to represent the team in Sports Illustrated’s annual swimsuit edition. Feeling the aches and pains from years of performing and realizing she had likely accomplished as much as she could as a dancer, Clover decided that this year, her fifth with the Magic, would be her final season. That doesn’t mean, however, that Clover is leaving a business she has devoted most of her life to. Instead of dancing in the limelight, Clover is looking to move into the wings as the dance-team coordinator for the fledgling Leesburg Thundercats professional basketball team. Clover accepted an offer from Thundercats’ owner Kevin Simmons in December to become the franchise’s first dance-team coordinator. She held tryouts throughout the county and the seven-dancer team was unveiled recently during Eustis’ Georgefest parade. “Part of my job is to get the Thundercats name out in the public and let them know we’re bringing professional basketball to Lake County,” Clover said. “We’re going to do that by performing at games and by giving dance clinics in the community. We want to be an active part of the community and become a positive influence for young people. 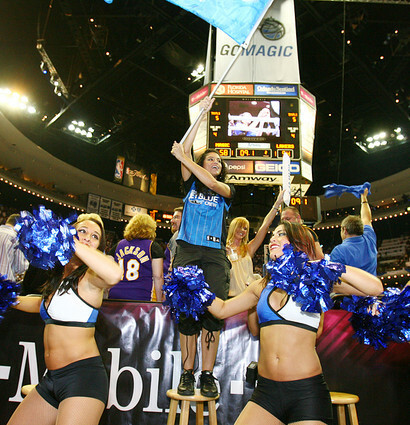 Clover said she decided to make this season her final year as a Magic dancer after suffering a torn labrum and assessing the amount of wear and tear her body has endured over the years. She recently turned 30, and while there is no age limit to be a Magic dancer, the grueling annual auditions to make the team were taking their toll. Also, because of her commitments to the Magic, Clover was not spending as much time with her family. She has been married for nine years to her husband, Cliff, who she met when she danced on a cruise ship. In addition to her dancing duties, Clover works part-time at her husband’s real estate business in Kissimmee and she also has taught dance classes at a studio in in Kissimmee. Simmons said he when he learned about Clover’s availability, he spoke with the Magic’s dance team manager Jeanine Thomas, who recommended that Simmons hire Clover. 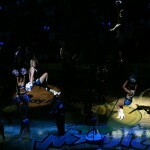 Simmons said Clover went to work immediately to form a dance team, juggling that with her commitments to the Magic. “Deanna’s done a great job helping to put a face on this franchise,” Simmons said. “When I started this project, I wanted to move slowly and do things right. Our goal right now is to get the word out about the Thundercats and what better way to that than with a professionally organized dance team. Simmons said he currently is exploring his options for finding a home for the Thundercats. He has signed three players to contracts, including former Eustis High School standout Jimmy Hudson, and hopes to fill out his roster after the NCAA Tournament and the NBA Draft. One of the biggest selling points for the Thundercats, Simmons said, will be the cost of attending a game. Whereas a family of four can expect to spend in excess of $100 — and oftentimes more — to watch a Magic game, he believes families will be able to go to a Thundercats game for less than $40. “We’ll be affordable entertainment,” Simmons said.  “I’m hoping to get area businesses on board as sponsors and work together with community leaders to make this Lake and Sumter County’s team. It may take a year or so to get completely established, but I can see the Thundercats becoming something everyone can rally around and take pride in. The Thundercats will host the Orlando Kings at 7 p.m. March 21 at the Everett Kelly Convocation Center at Lake-Sumter Community College. A charity game will begin at 5 p.m.
A portion of proceeds from the game, according to Simmons, will be donated to the American Cancer Society.